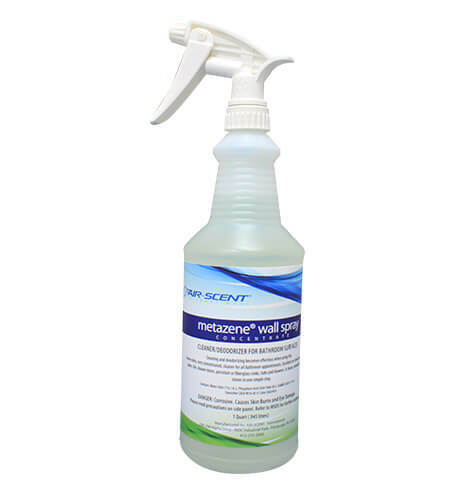 Metazene® is the most effective odor neutralizer in the marketplace because it destroys the particles that cause vaporous malodors at their molecular level. Other odor neutralizers use perfume and water and rely on enzymes to eliminate odors born from mildew, mold, smoke, urine, trash and more. While it’s suggested that enzymes induce a microbial action which digest the malodor, this method is not effective, particularly when dealing with residual or vaporous odors in the air. These neutralizers merely mask odors; Metazene® destroys them. For use on splash panel dividers, walls, around urinals and more. Available in Quart sized Sprayer in Cherry or Floral scents. WARNING: Do not use on floors or steps. During application be sure that spray mist fallout does not reach the floor, as it will cause a dangerous slippery condition. Do not apply to toilet seats or other surfaces people may contact. Test all surfaces for colorfastness before using. Do not apply near fire or open flame. Remove cap and insert oil-resistant trigger sprayer. Tighten sprayer cap. Adjust the trigger sprayer nozzle so that a coarse spray will be delivered. Apply to sides and undersides of urinals and toilets, adjoining walls and splash panels where urine and uric acid salt have been deposited. DO NOT APPLY TO TOILET SEATS OR OTHER SURFACES PEOPLE MAY CONTACT. Areas contaminated with uric acid salt can be identified by darkening room and using an ultra-violet inspection light. For best results use in conjunction with Air-Scent® fan fresheners and/or drip appliance dispensers.